To demonstrate how BC home sales activity has dropped off in the 14 months after policymakers changed the qualification process for uninsured mortgages, a provincial real estate association has drawn a line in the sand — or rather, a chart. With the release of the British Columbia Real Estate Association (BCREA)’s February home sales statistics earlier this month, the industry association included the chart, giving a before-and-after look at seasonally adjusted BC home sales, which plummeted 27 percent last month on a year-over-year basis. 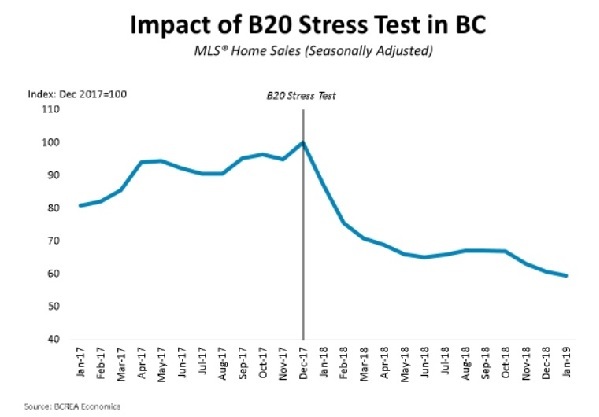 “Prospective homebuyers continue to be sidelined by the mortgage stress test,” says Brendon Ogmundson, BCREA’s deputy chief economist, in a news release. “As a consequence, and despite a strong BC labour market, sales remained slow in February,” Ogmundson. Last January, federal policymakers expanded mandatory stress testing to the uninsured mortgage segment. The rule change meant that even if a borrower was able to cobble together a downpayment of 20 percent — thus not requiring mortgage insurance — they’d still be need to qualify at a rate 200 basis points higher than what their bank was offering. Insured mortgage applicants already faced stress testing. BC home prices have also taken a hit since the federal policy was implemented. The average selling price of a residential property in the last month was $678,625, down 9.3 percent from a year prior. Ahead of the release of the Canadian federal government’s budget, which was unveiled on March 19th, Justin Trudeau’s Liberals faced calls to relax the stress tests. No such change appeared in the 2019 budget, although a number of other items focused on housing affordability did. These items include raising the maximum amount a first-time homebuyer can draw from their RRSP to finance the purchase, to laying out plans for a shared-equity mortgage scheme that would see the Canada Mortgage and Housing Corporation get a stake in a first-time homebuyers property in exchange for some downpayment financing. “While we welcome the incentives for first-time home buyers, the announced measures fail to address the damage done by the mortgage stress test,” says BCREA in a separate response to the budget.